Formal Summation cruised to an easy Laurel Futurity win today. Photo by Laurie Asseo. 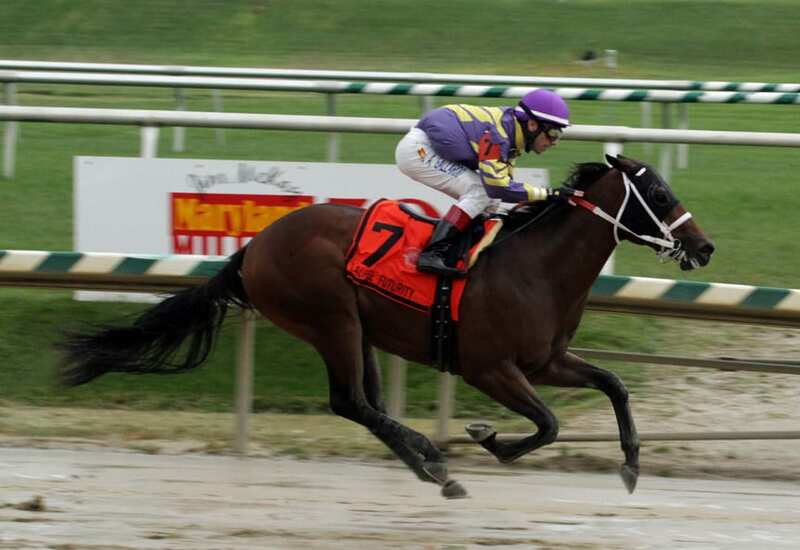 The sky, it appears, is the limit for West Virginia-bred Ruby Notion. The two-year-old filly, who has now made four starts at four different racetracks in two different countries — she ran fifth in a stake at Royal Ascot earlier in the year, to go with three wins from three North American starts — made short work of her rivals in the historic Selima Stakes at Laurel Park today. In the $75,000 Selima Stakes, which was taken off the turf, Silverton Hill’s Ruby Notion, a winner last time out of the Colleen Stakes at Monmouth Park, drew away effortlessly from eight others to win the 5 ½ furlong event by 8 lengths in 1:05.06. Look Who’s Talking was second, Holiday Wishes third and favored Table Jumper fourth. That was more than a second faster than the 1:06.21 recorded by juvenile boys in the Laurel Futurity one race later. Ruby Notion, trained by Wesley Ward and ridden by Trevor McCarthy, raced outside Atara in second leaving the gate until putting that one away and then opening up her advantage down the stretch and being ridden out. Trained by Wesley Ward, the daughter of Great Notion has now won three of four, including two stakes, and the winner’s share pushed her earnings to nearly $100,000. “She’s probably going to go places, this one,” McCarthy said.